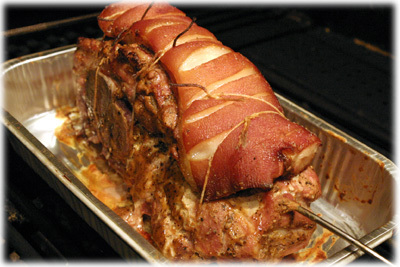 The Pork Shoulder roast is usually an inexpensive cut of meat and, if cooked properly, can also be one of the most delicious pork recipes you'll ever taste. 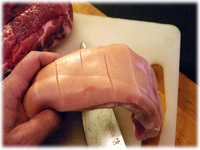 The meat has natural marbelling or fatty streaks throughout that keep it nice and moist while cooking. And, after seasoning the pork with a brown sugar and Dijon mustard paste we tie that thick fat cap back on the roast to baste it as it cooks on the BBQ. Once the roast comes off the grill all you need to do is let it rest a few minutes before removing the fat cap and slicing it up. This roast in the picture above was cooked to an internal temperature of 150F, was tender, juicy and full of flavor and had just a hint of pink in the center which is exactly the way it should be. 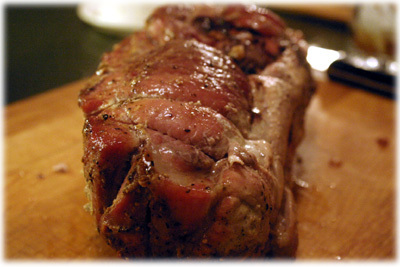 Select a pork shoulder roast with a nice thick fat cap attached and with the bone in. 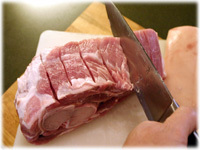 With a sharp knife carefully slice between the meat and the fat to remove the fat cap in one piece. 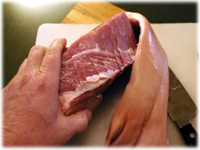 Make slices in the meat (called scoring) about 1/2" deep and about 1" apart. This will help the marinating paste penetrate the meat and will also keep the roast from curling up as it cooks. 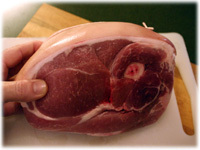 Score or slice the fat cap as well, just don't cut all the way through as you'll be tying this back on to the roast. 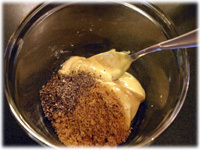 Add the dijon mustard, brown sugar and crush peppercorns to a medium bowl and stir well to combine. 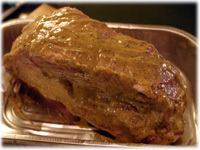 Cover the entire roast with the marinating paste. Go ahead and use your hands to get it into every nook and cranny. 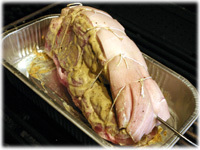 Lay pieces of butchers twine in a shallow disposable aluminum pan, set the roast on the string and replace the fat cap on top of the roast. Now you can just tie up the roast so the fat cap is well attached. Cover the roast and keep refrigerated if possible 4 - 6 hours. Preheat the grill to 300F and set up for indirect cooking (only turn the burners on one half of the bbq, keep the other half unlit). 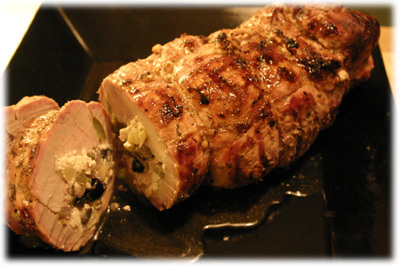 Bring the roast out of the fridge, keep covered and let come to room temperature before cooking. 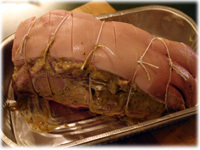 Insert a remote thermometer probe into the center of the roast, not touching the bone. Once the grill is up to 300F place the roast, uncovered in it's pan, on the unlit half of the bbq. Keep the lid closed while cooking. Once the internal temperature has reached 150F it's time to remove the roast from the grill. 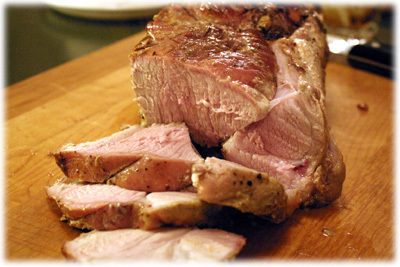 Lay the roast on your cutting board and cover with aluminum foil for 5 - 10 minutes. 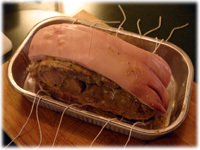 Remove the foil and fat cap and cut the roast into 1/2" slices and serve.